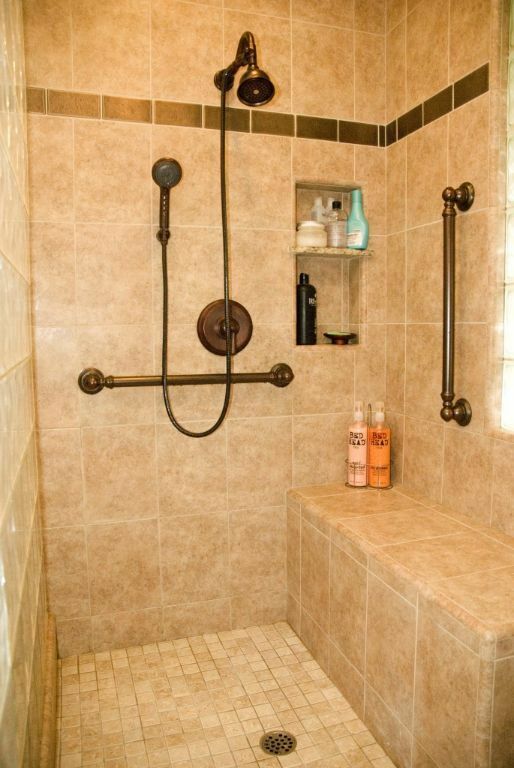 A bathroom is always a fun topic to talk about when it comes to the home improvement project. It’s one of the rooms which has to look and feel as inviting as possible to make it enjoyable to use for everyone. 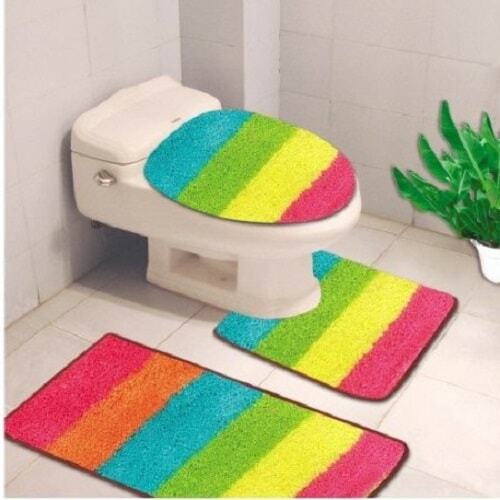 Yes, since you use your bathroom every single day, it’s always an important thing to make it comfortable. 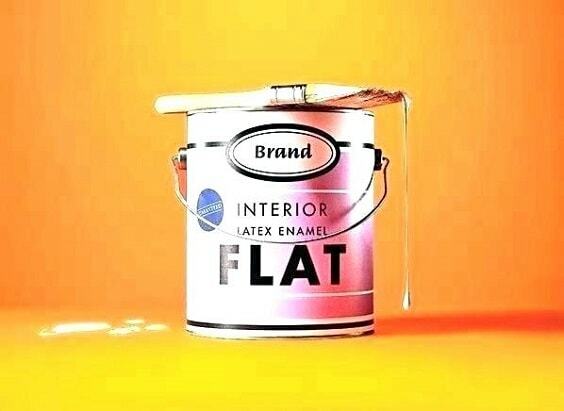 Of course, it relates to the bathroom fixtures, furniture, accessories, and decor items that you use to decorate it. One of the popular decoration styles which never fails to create a captivating bathroom is the masculine theme. 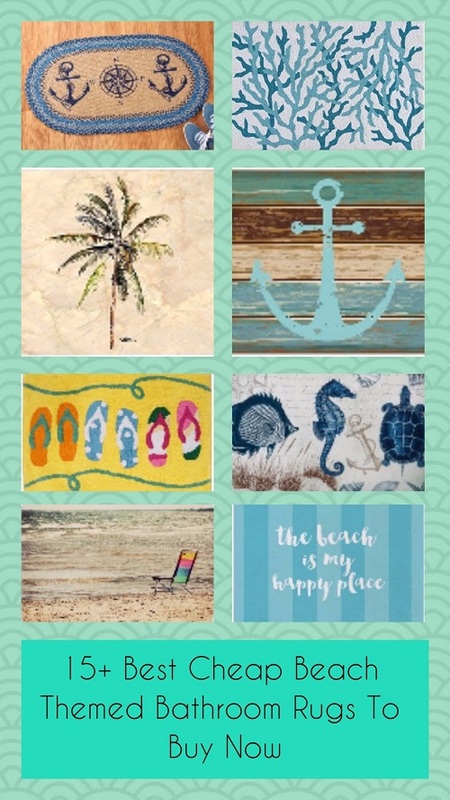 Many homeowners choose this kind of layout to decorate their bathrooms which are so inspiring to copy. 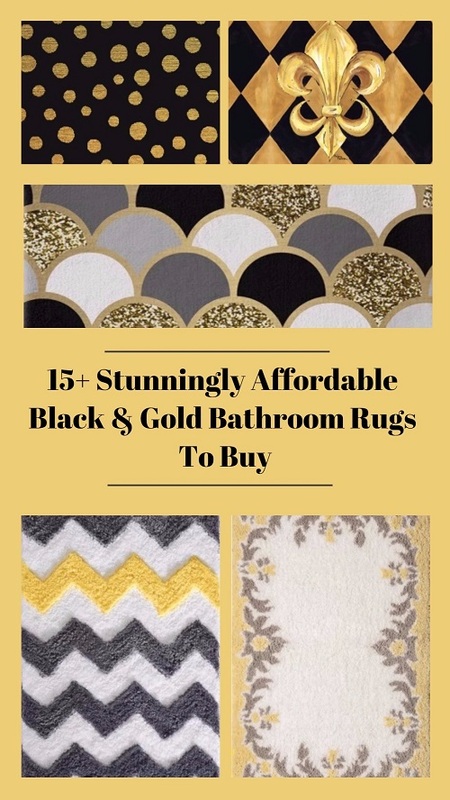 Basically, the masculine or manly bathroom is all about dramatic, elegant vibes that come from the color choices and fixture or furniture design. 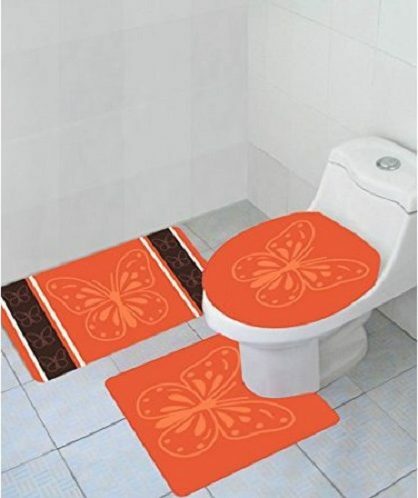 It’s always an applicable theme for any bathroom layouts. 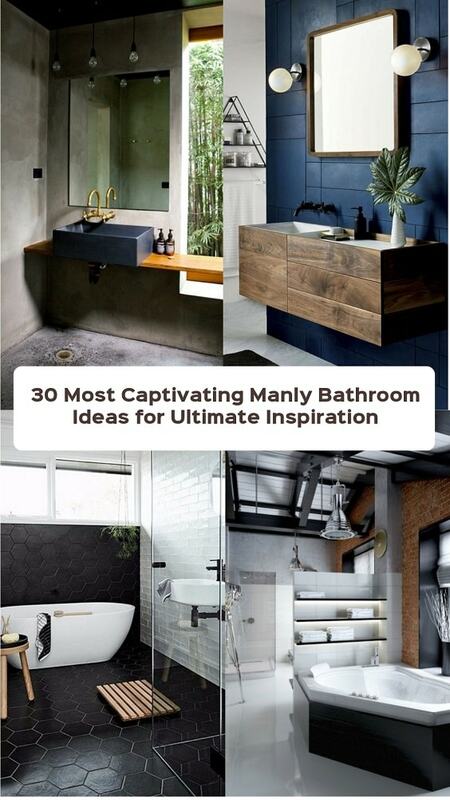 Here, we have picked lots of manly bathroom inspirations which are so worth to be your ultimate references. 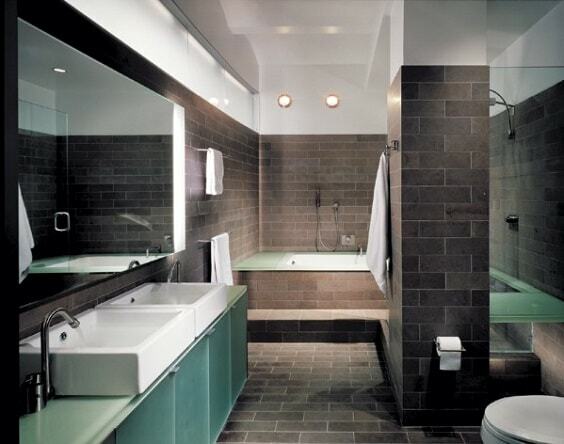 Their choices of color, fixture, furniture, and other elements of a bathroom are so cleverly inspiring. So let’s just keep scrolling to find out or best manly bathroom ideas! 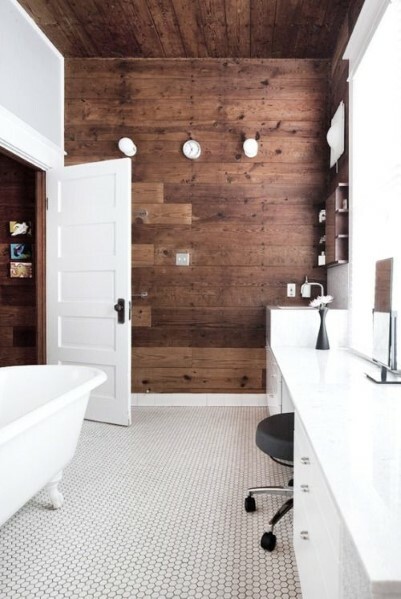 Dominated by the washed wood wall, this bathroom looks gorgeously rustic which works well to create a masculine vibe around. 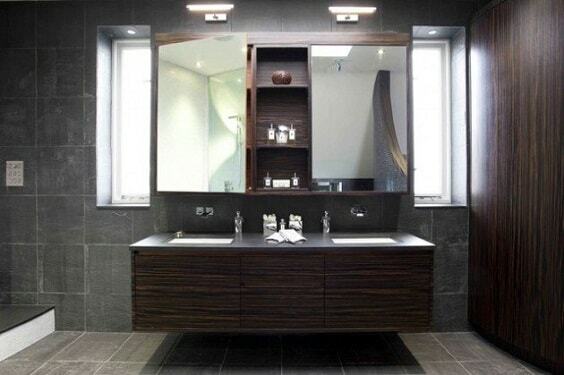 The black long vanity which works as the focal point of the room gives a bold touch perfectly. The brick style tile in rustic finish covers almost all of the walls and flooring of this manly bathroom stunningly. It creates a more decorative nuance yet still keeps the rustic characteristic to make it look more masculine. The white marble tile with its natural pattern becomes the key to creating a natural look in this bathroom. Then, the black wall complements it to add a more masculine vibe. This manly bathroom is a good inspiration for you who want a neutral layout which looks more decorative. 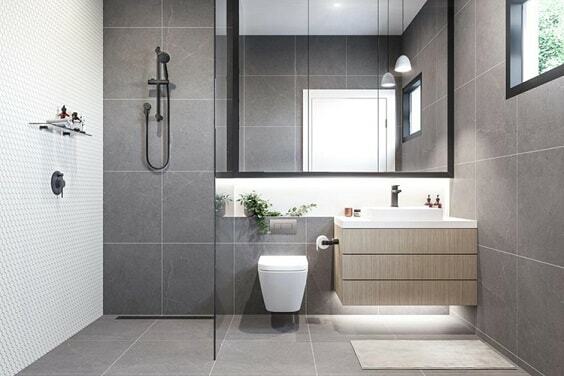 One of the popular materials which work well for a manly bathroom is concrete, and you can use for the wall and flooring. 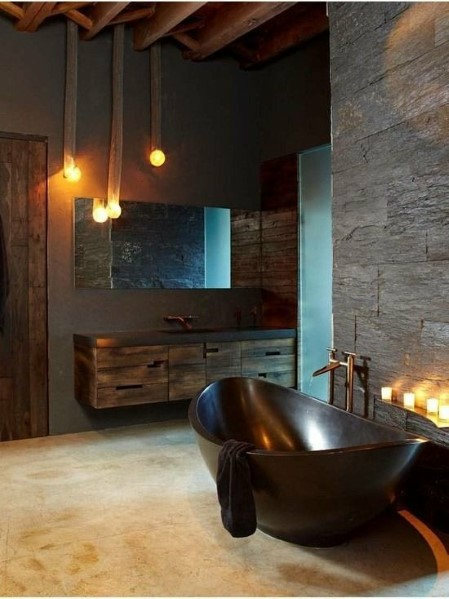 This idea shows a smart combination of rustic concrete wall and flooring with vintage-style bathroom fixtures. 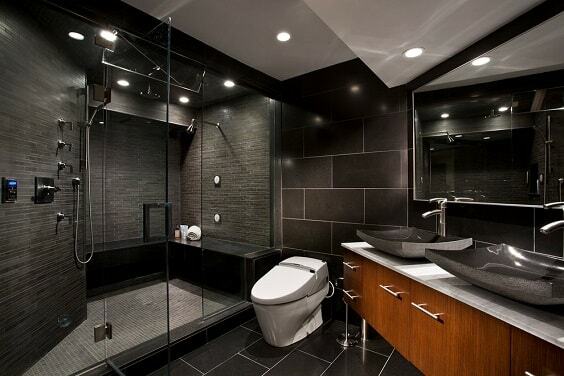 The awesome bathroom with a superb bold look which is dominated by black. 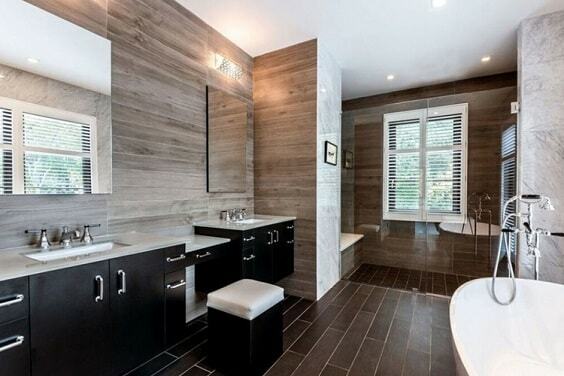 It has the different patterns of flooring which don’t make the bathroom look too dark. Then, the reddish wood cabinet colorizes its overall look outstandingly. This one is for you who are looking for a manly bathroom with a brighter atmosphere. 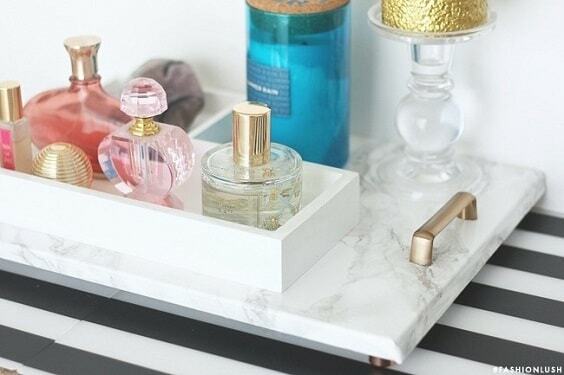 It’s dominated by white and combined with the earthy elements like wood and marble. 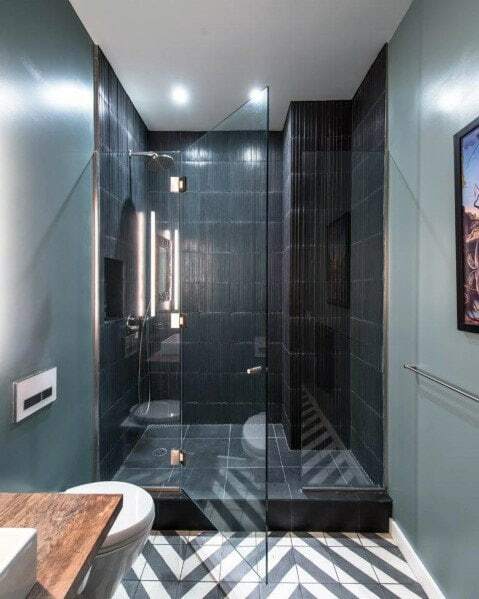 To create a more masculine vibe, the black tile covers the shower room and vanity base (complete with its black countertop). It’s surely a great idea to choose an industrial theme to decorate a manly bathroom since it deeply relates to the masculinity. If such theme mostly looks boldly dark, this idea shows how to make it much brighter very well. 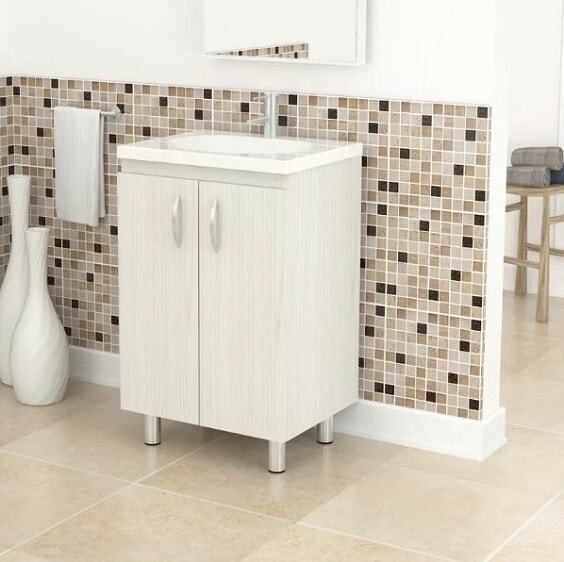 The key is definitely the choice of glossy white tile which covers its wall and flooring gorgeously. 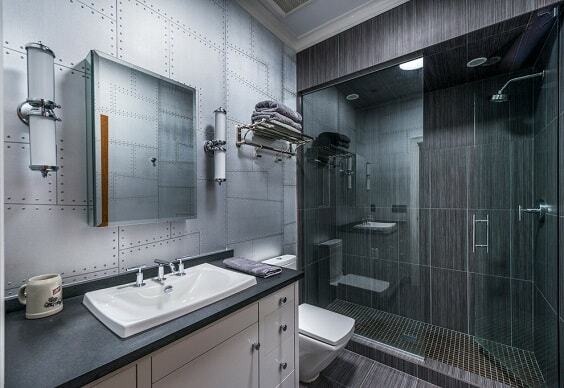 As a neutral shade, grey always works well to colorize a manly bathroom. You can combine the color with an earthy touch to create a masculine nuance which feels so refreshing just like this layout shows. The festively catchy manly bathroom with geometric tile in black and white which also make it look more colorful. 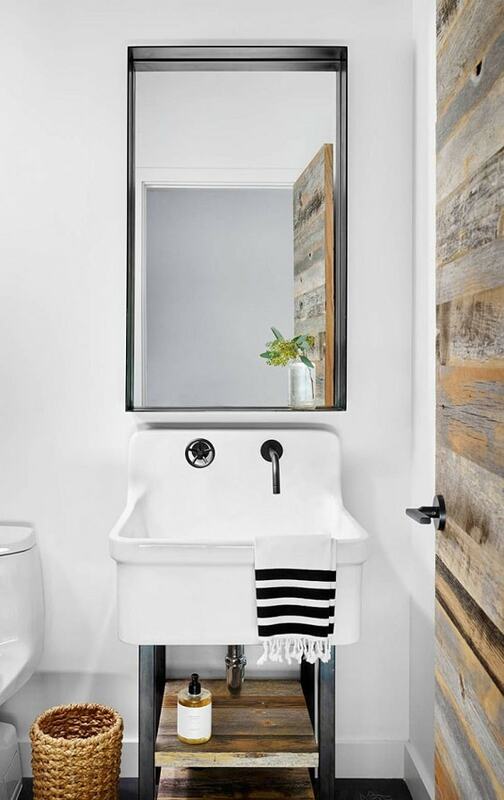 A vanity with weathered finish adds an outstanding bathroom which becomes a unique combination to the room’s overall look. Everybody loves an all-white interior so it’s always a good option to apply such look to a manly bathroom. 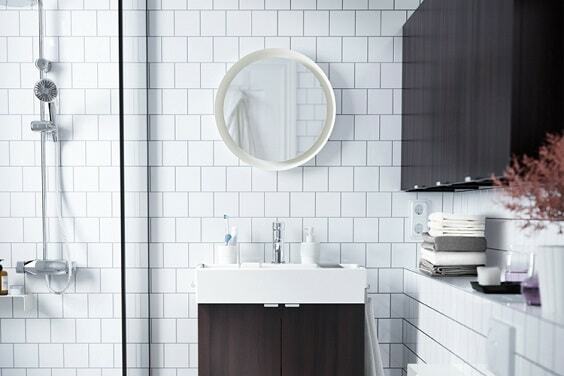 The rustic touch is chosen to colorize an all-white bathroom which makes it look well for a man. 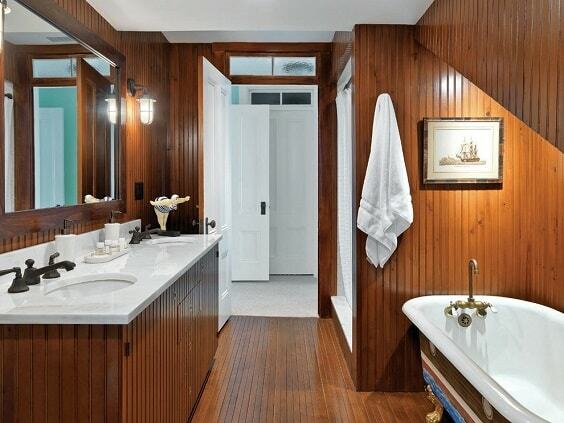 The wood grain is a good choice to give a more decorative touch to a manly bathroom. Here, the vanity base and wall are finished in a matching look which makes a grey rustic decor look more attractive. Lots of home improvement magazines always make a long-narrow bathroom as their headlines today since it becomes so popular recently. 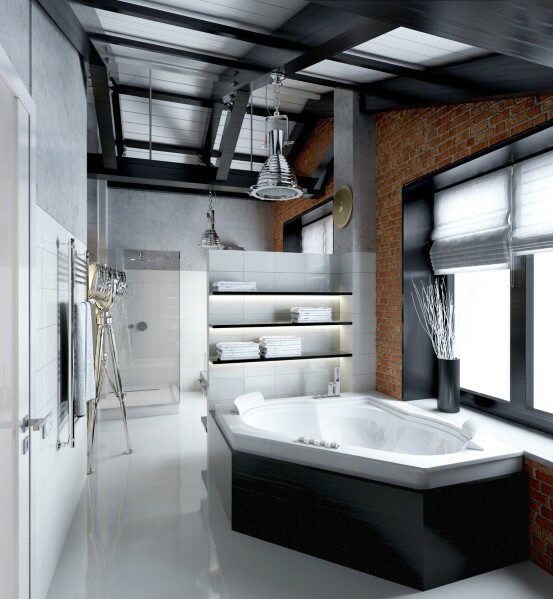 This idea is a great one to copy if you want to have such a bathroom with a masculine look. 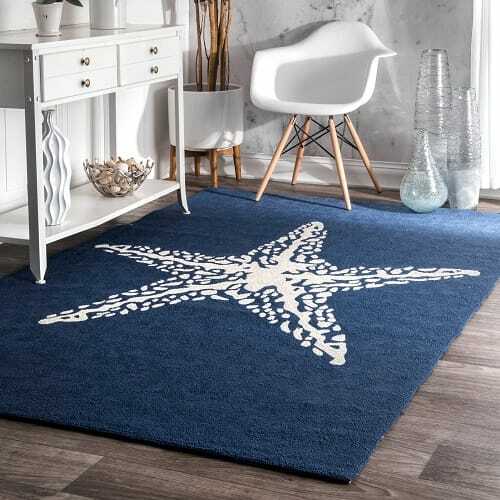 The room is dominated by glossy soft blue and the BW geometric flooring adds a stylish festive touch perfectly. 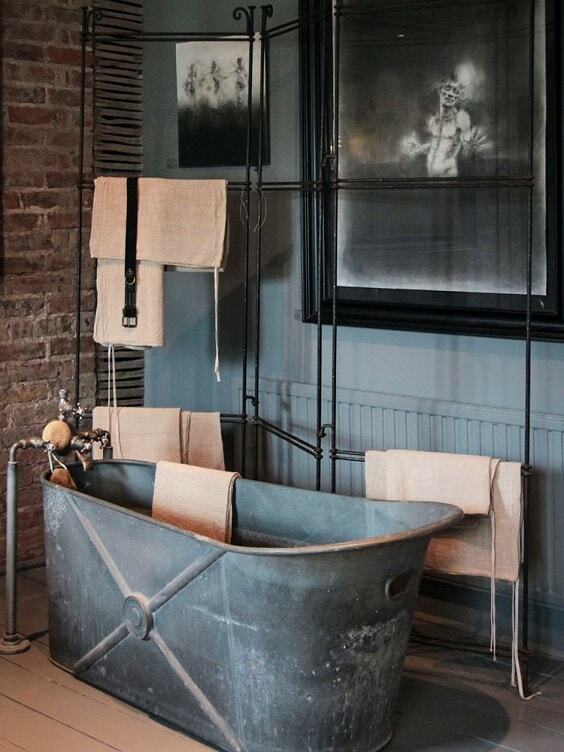 Though farmhouse looks kinda cute, applying such theme to create a manly bathroom is totally a fun thing to try. 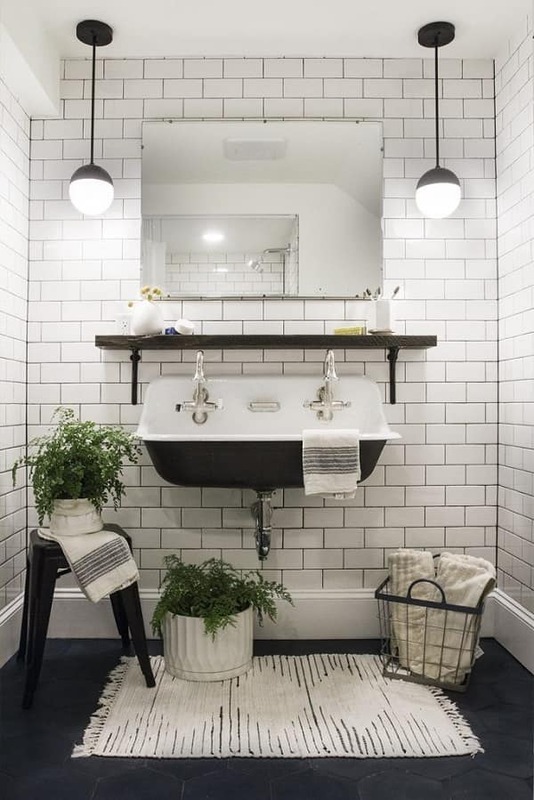 This idea shows a chic bathroom with the subway tile wall which is decorated with the bold cabinets, creating a simple yet adorable look which is so tempting to copy. 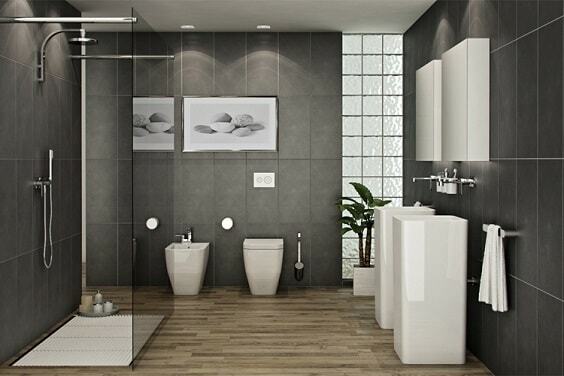 For you who want a superb neutral bathroom, this idea is the one that you have to include in your inspiration list. 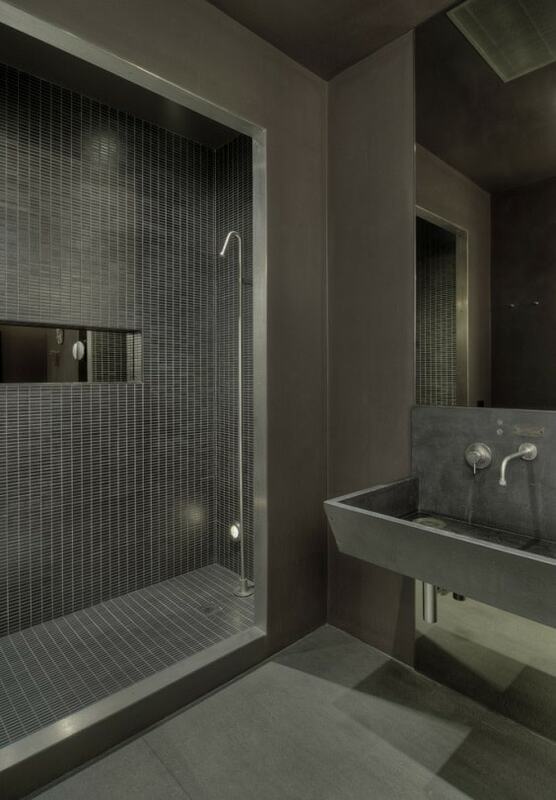 It’s designed with the combination of concrete and decorative grey tile which looks so masculine. The stylish combination of white and navy in this manly bathroom is so mesmerizing, It creates a brightly inviting atmosphere while still keeps its masculinity in a very admirable way. 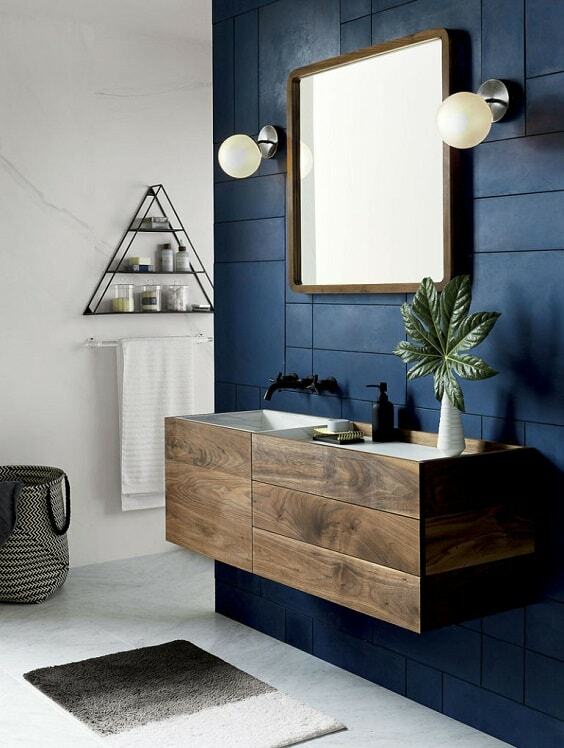 To emphasize that the room is ‘made’ for man, the floating vanity in the raw wood finish and industrial accessories are placed. Who says you can’t go cute with a manly bathroom? 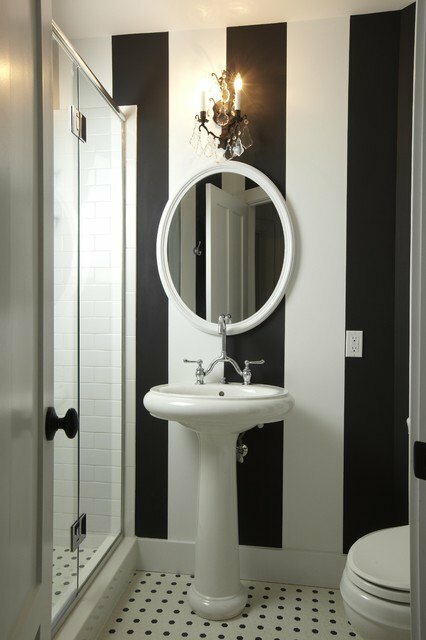 Well, this idea shows a fashionable decor which is the result of its striped wall and polka-dot flooring in a chic black and white look. 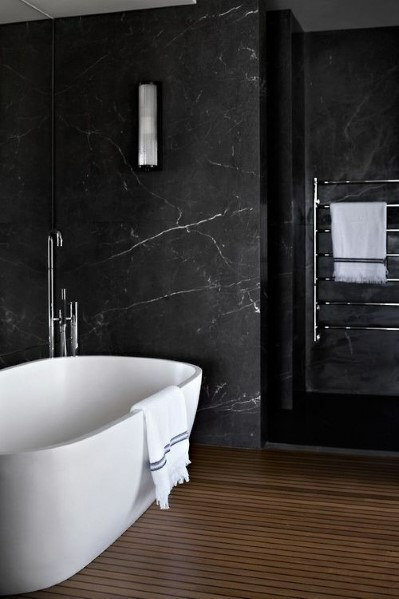 The glamorous manly bathroom which is dominated by the black marble tile. Then, the wood flooring is chosen to add a much bolder look to the decor of the room. Another manly bathroom with a nice bright atmosphere with the mixture of light grey and white. Some white furniture and fixture also make the room look much brighter perfectly. The metal wall in this manly bathroom makes it look distinctively attractive. 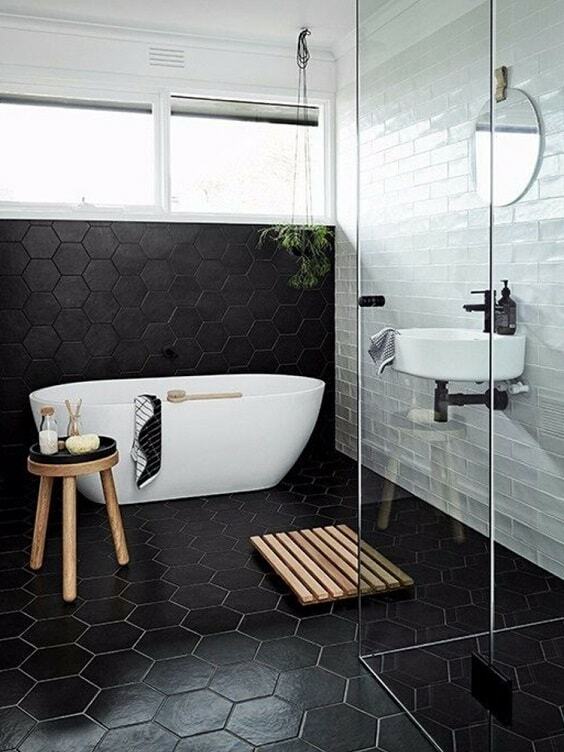 Then, the black tile with the earthy texture adds a bold touch to the bathroom. Using this kind of bathroom will take you back to the ancient area which makes it so exhilarating to enjoy. 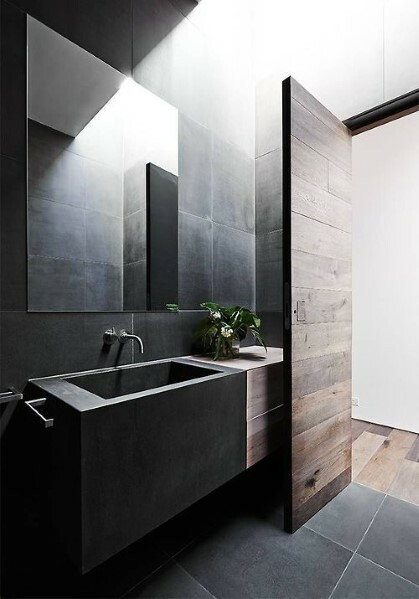 The weathered wood wall, vanity, and door, concrete flooring, and the exposed beam are the main factors which create such look for this manly bathroom. Also, a unique hot bathtub in the copper finish makes the room look way more stylish. If you are willing enough to make your bathroom look as old-fashion as possible, you can refer to this unique inspiration. The exposed brick, vintage towel rail, and rustic copper bathtub are enough to make the bathroom look simply outstanding. 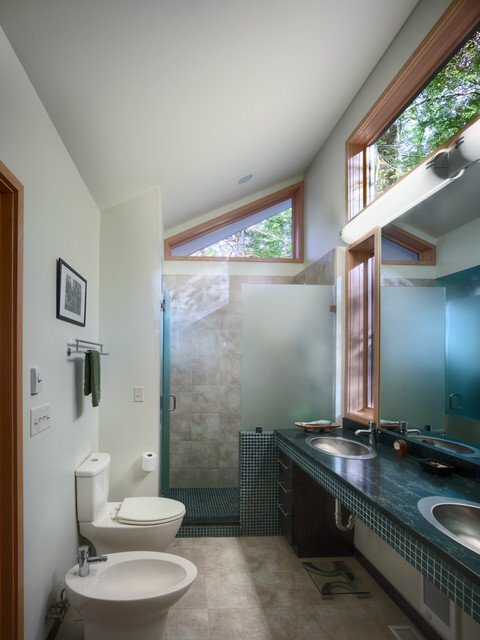 Basically, this one is a manly bathroom with the gorgeous modern and earthy element. Then, an awesome shower area in minimalist style with the LED shower head on its ceiling makes it look way more sophisticated. Adding the woody touch to an all-white bathroom is always the easy way to create an amazing decor. Here, the reclaimed wood is used to decorate the ceiling and one side of the wall which gives a dramatic look cleverly. 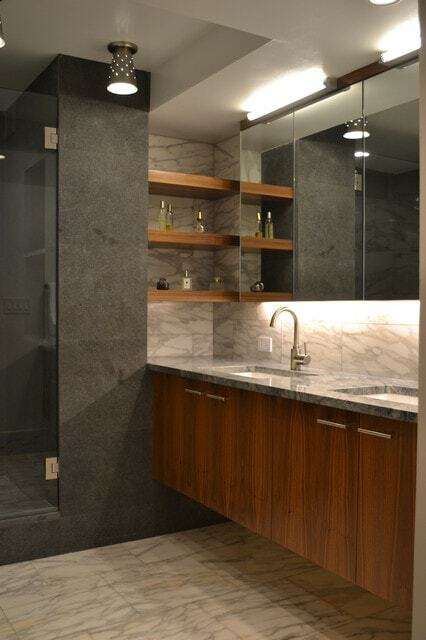 The brick-style tile in matte grey finish complements the wood element of this bathroom beautifully. It’s surely a good inspiration for a manly bathroom which doesn’t look too bold. The warm manly bathroom which is fully covered by wood in the glossy chestnut finish. To neutralize the room, the white marble countertop and bathtub is chosen smartly. 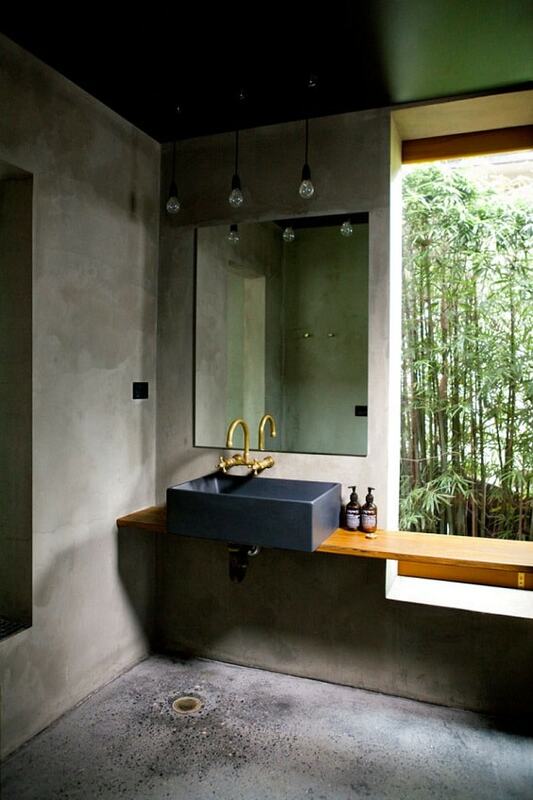 The naturally elegant manly bathroom with the gorgeous combination of the black and rustic element. It’s surely an inspiring decoration which looks modern and earthy at the same time. Choosing the decorative tile in a neutral shade is one of the considerable ways to create a festive bathroom with a masculine vibe. 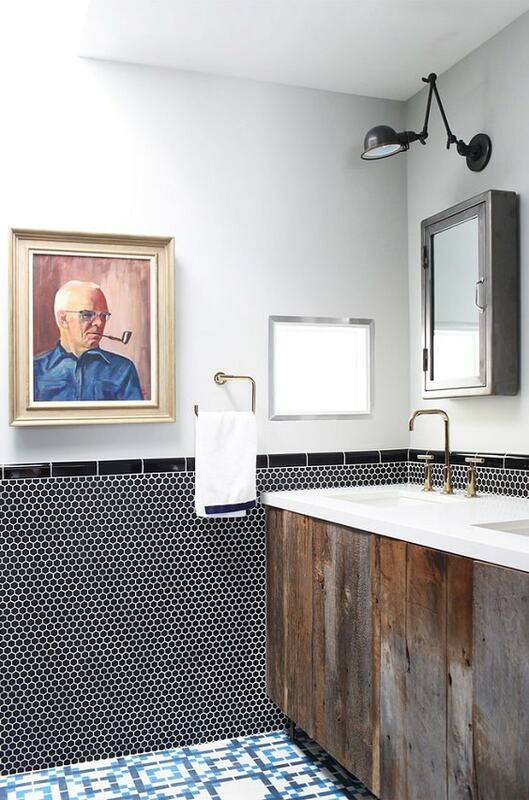 In this manly bathroom, the honeycomb black tile and white subway tile complement each other stylishly. So those are some inspiring manly bathroom ideas that you can use as the ultimate reference to make our beloved bathroom look more masculine. 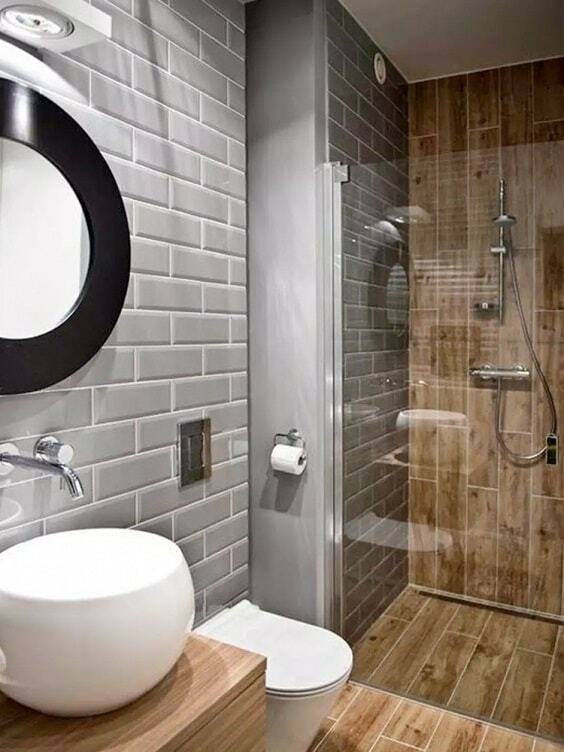 Those ideas smartly mix and match all the elements of a bathroom which make them so tempting to copy. 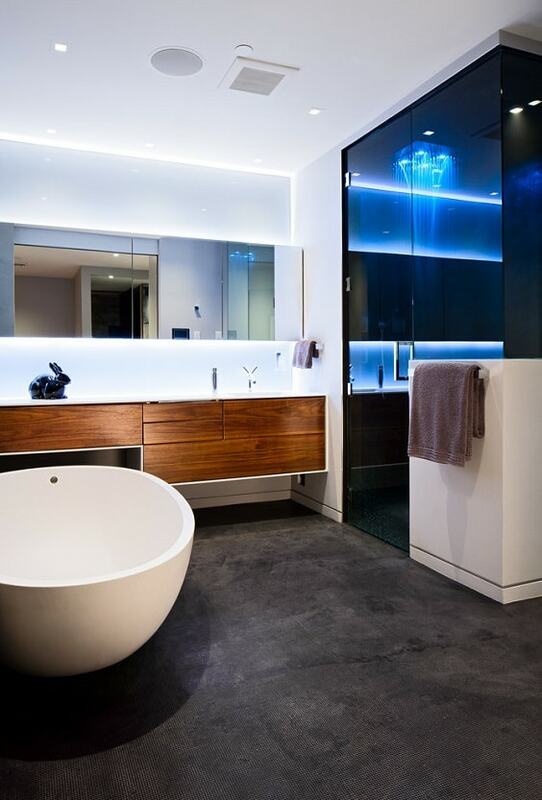 You can choose the best manly bathroom from the inspirations that we have picked. Find the one that suits your needs and get ready to have a captivating manly bathroom!